Growth, Diversity and Customer needs are driving Futura to increase the size and enhance the capabilities of their technology integration services. For years our integration services operation was housed in the warehouse of our corporate HQ. Five years ago we moved outside the four walls to a nearby remote facility. We quickly outgrew that facility and added a second services center. Trying to deal with logistics with three locations we decided to obtain a larger self-sufficient operations center and have recently completed the consolidation of operations. “It was a lot of hard work, but our team worked together to make it a very organized relocation. We’re ready for business and none of our clients were impacted, states Dean Wright Technology Center manager. 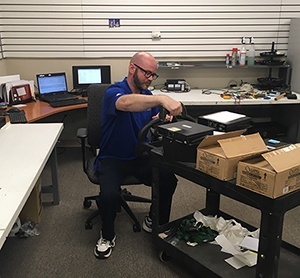 - PC Configuration- We have expanded our PC configuration capabilities into our new larger config room, including secure storage for high dollar inventory and customer owned consignments. We have enhanced our networking infrastructure to allow us the ability to configure and scale parallel networks dedicated to each of our customers unique needs. We have the ability to configure or image a wide scope of PC’s, laptops, handheld computers, scanners, tablets etc. - Battery Lab- In our new battery lab we now have the capacity to test, configure, refurbish, and design power solutions for our mobile technology. Including our LiFe DC battery technology, and our Continuum power systems. - Green – We have maintained our zero landfill compliance. - Telemedicine – We have expanded our own Telemedicine product line. - Workforce Support – Our new Technology Center was built out to accommodate surges in workforce. Our field service technicians, engineers, help desk and technical support personnel all rotate from the field to hands on integration. - Cart integration – In our new Technology Center we continue to provide our customers with the flexible or custom mobile medical cart configurations they have all come to expect from Futura. To do this we need to control the design, manufacture and assembly of the carts and all of the unique parts that go into those specialized solution. Election years are a good time to look back to see where we have been. They also afford an opportune time to look forward and see what lies over the horizon. This exercise will examine the challenges facing a new manager entering a packaging plant for the first time. This was a very good time for manufactur- ers. The car you drove was made by Ford or General Motors, your television was made by RCA or Zenith, and your clothes were made in textile mills that filled New England and the South. Almost every- thing consumed in the United States was made there, and the packaging containers required to ship these goods were made in plants from coast to coast. Estimates and samples were all built by hand. More sophisticated companies had brought in adding machines to help speed up calculations, but we were still several years away from microchips and calculators. With gas at 34 cents a gallon and mostly local deliveries, logistics were something of an afterthought. Lead times were measured in weeks, and manage- ment structure was based on the shared experience of military service. A new employee would spend most of their time learning how the plant func- tions, with particular attention paid to learning the machines and the manufac- turing process. Periodic trips to the office to learn about estimating and scheduling were part of the curriculum, but more emphasis was placed on plant knowledge. At the end of the day you could go home, and except for the occasional paperwork, leave your work life behind and enjoy time with your loved ones. Operations — The intelligence to respond to orders with the correct amount of time and effort. Operations: Better, Faster, Cheaper Like a well-tuned athlete, your plant is a combination of intelligence, strength, and quickness. While you can be successful with two of these three attributes, excellence requires all three. If you were to ask 100 people in the packaging community what one word would reflect the greatest change facing the industry, many would say manufacturing and distribution; others might say shifting tastes; still others may say sustainability. And, in fairness, none of these answers would be wrong. But I contend the one word that is going to have the greatest impact on the packaging industry is this: demographics. Today’s consumers are living in more urban areas than ever before, and these consumers tend to be single or a single-parent household, technicallysavvy, and willing to indulge on premium products that enhance their quality of life. These members of Generation X and Y (born between 1965 and 1994) are in their prime earning years, and with fewer family obligations, they are not averse to spending money. Amtech has spent a lot time examining our workforce and how to grow it during our Innovation Revolution. Given our move to the cloud, we made a decision to fill specific positions with a technology focus, which leads to hiring employees outside the Corrugated Industry. By doing this, we know it is our responsibility to invest in our people by educating our growing workforce and assisting them to develop their Packaging Industry IQ. To that end, we piloted an Amtech boot camp with various components. The first component was sending employees on-site to a Corrugated Plant where they had the opportunity to walk the plant floor and see a Corrugator and Converting Equipment in action. The second was a two day Packaging 101 seminar taught by Ralph Young, AICC Consultant. The next phase of this program occurred recently, “A Day in the Life of the Packaging Industry”. 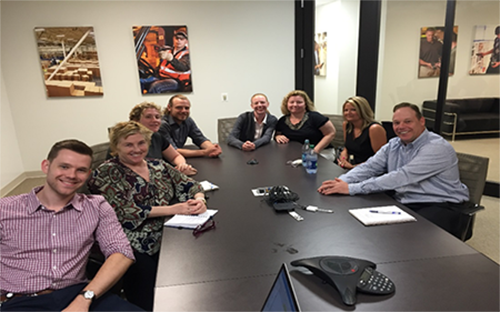 We invited Acme Corrugated Box Company into our office for an informal lunch and learn. Debbie Boone, Client Relations Manager, and Jennie Becker, Controller, represented Acme.